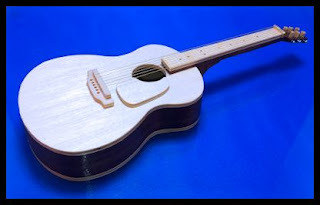 8.5" Mini Guitar. Realistic scroll saw pattern. 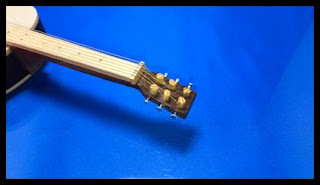 This mini guitar is 8.5 inches long. I made this as realistic as possible. 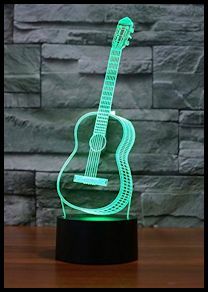 It has six strings, tuning pegs and a hollow body. I put complete cutting and assembly directions in the pattern book. This pattern book is loaded with pictures so it will be a bit larger of a download than usual. I did not have time tonight to make a guitar stand but I plan to add one tomorrow if I get time. This project requires some precision work and you have to sand and carve to some parts for a good fit. 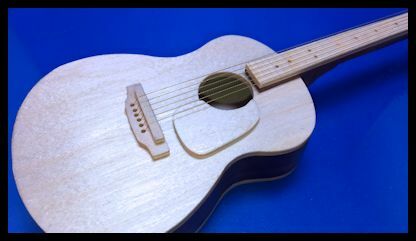 I used small nails cut to length for the tuners and gold thread for the strings. You will need a 1/16" diameter drill bit for drilling the tuners and string holes. It's tight and tedious work but the end result look pretty cool if you take your time. I will start the next Bear Woods sponsored giveaway this week. Keep your eye out so you can enter.